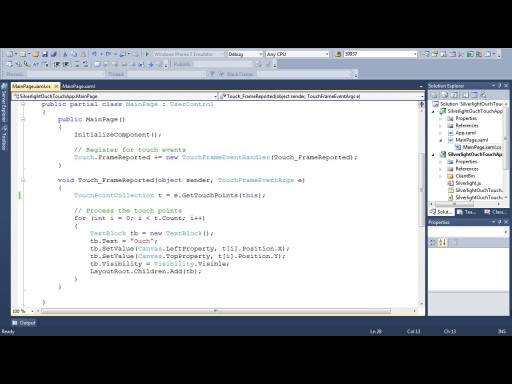 The webcam and microphone API was the first thing I played with after the Silverlight 4 beta was released at last year's PDC. In my opinion, it's one of the coolest features. You can do a lot of fun Silverlight applications with it too. 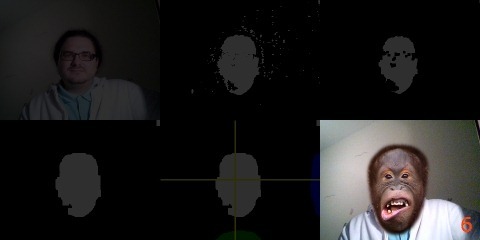 When the SLARToolkit was released, I finally had time to implement real time face detection using the Silverlight 4 webcam API. 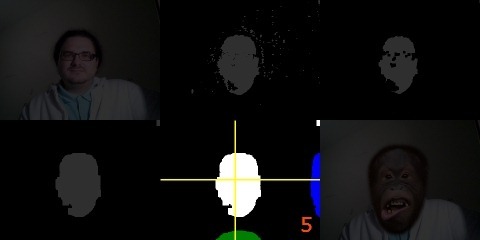 This article will describe the simple facial recognition method that searches for a certain sized skin color region in a webcam snapshot. 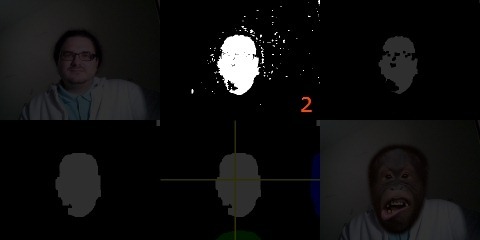 This technique is not as perfect as a professional computer vision library like OpenCV and the Haar-like features they use, but it runs in real time and works for most webcam scenarios. You need a webcam and at least the Silverlight 4 runtime installed to run the sample. 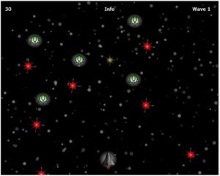 At the moment the release candidate is available for Windows and Mac. The facial region should be illuminated well and the background should be in skin color contrast to get the best results. You can start and stop the webcam with the Button, or you can load an image from disk with the Button. 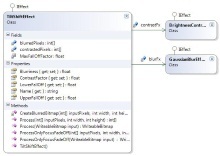 Use the ComboBox to change the demo mode from “Highlight” to “Image.” “Highlight” simply draws a red ellipse around the detected face and “Image” overlays the facial region with an image. The ape's head is the default image (Figure 11), but it's possible to apply a different picture by entering its URI in the TextBox. You can use the Slider controls to alter the skin color thresholds in the YCbCr color space (see Step 2: Filtering the Skin Color). 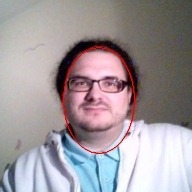 Save the result of the face detection (including the overlaid image) to disk with the Button. When you click the Button for the first time, you'll need to give permission for the capturing. 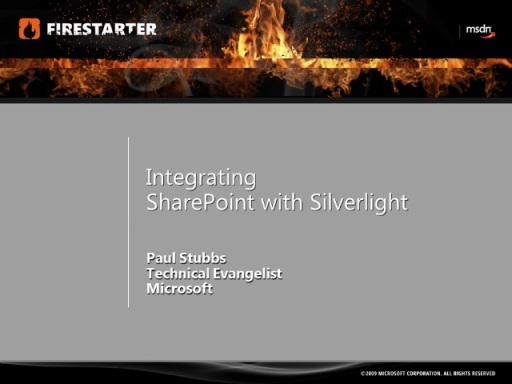 This application uses the default Silverlight capture devices. You can specify default video and audio devices with the Silverlight Configuration. Just press the right mouse button over the application, click "Silverlight" in the context menu and select the "Webcam / Mic" tab to set them. The idea is to take snapshots from the webcam, filter the skin color out using color thresholds, apply filters to reduce the noise, find the facial region—and then do fun things with this information. In the following sections I'll show you how to do this using a simple skin color segmentation approach. For clarity, I've reduced code listings to only what's relevant here. The complete source code is available at CodePlex and licensed under the Ms-PL. 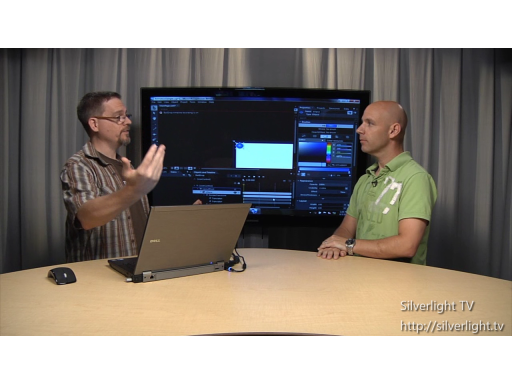 The Silverlight 4 webcam API is easy to use. 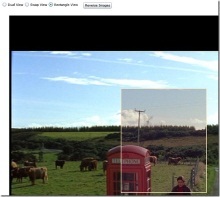 The CaptureSource class provides the webcam stream and you can use it as the source of a VideoBrush, which in turn fills a rectangle to show the video feed from the webcam. We'll use the default video capture device, but you can also iterate CaptureDeviceConfiguration class to get all the capture devices on the system. 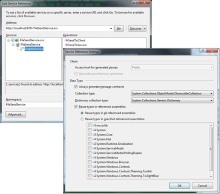 The user can specify the default video and audio devices with the Silverlight configuration; he or she only has to press the right mouse button over the Silverlight application, click "Silverlight" in the context menu and select the "Webcam / Mic" tab to set them. 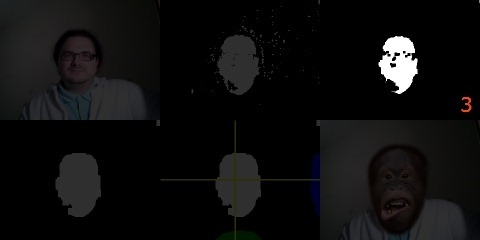 Now that we have the webcam up and running, we need to take snapshots from the video stream to feed the face detection. You can use a custom VideoSink implementation for this task, but the CaptureSource also provides the built-in CaptureImageAsync method, which is easier to use. The performance is not much worse than a custom VideoSink. We use a DispatcherTimer here to call the CaptureImageAsync method. Every time the capturing is done, the CaptureImageAsync method fires a CaptureImageCompleted event, and the EventArgs provides a WriteableBitmap that contains a completed snapshot. 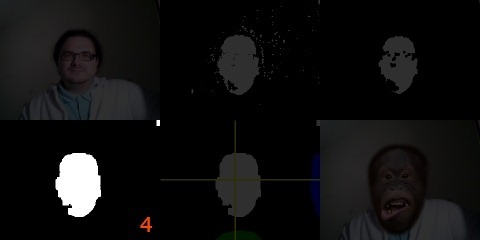 The DispatcherTimer is initialized to perform this capturing task every 40 ms.
After grabbing an image from the webcam, you need to filter the skin color; this lets you find the face in a following step. The WriteableBitmap provided through the CaptureImageCompleted event uses the RGB color space to represent the pixels and is actually just a 32 bit integer array that stores the alpha, red, green and blue (ARGB) byte components for all the pixels. The RGB color space has some major drawbacks when it comes to filtering certain color ranges.  For example: we'd like to filter the skin color with a robust method that's not too much affected by the brightness of the image, but doing this in the RGB color space would imply a larger color space volume—so you can't use simple value thresholding. Fortunately, there are other color spaces available that don't suffer from such problems. The HSV color space, for example, defines the color in its three components as Hue, Saturation and Value (Brightness), where the actual color (Hue) is represented as a circle from 0° to 360° and the brightness is the height of a cylinder. Since the relevant skin color Hue ranges from 0° - 60° and 300° - 360° (which involves extra calculations) and the RGB to HSV conversion is more computationally expensive than other color space conversions, we use the YCbCr color space for the skin color filtering. YCbCr stores the brightness in the Y component and the chroma (color) information in the Cb component as blue-difference and in Cr component as red-difference. The RGB-YCbCr conversion can be done with simple addition and multiplication operations. The Y component ranges from 0 to 1, Cb and Cr from -0.5 to 0.5. I tested several photos of different colored persons, and found that the following values cover most skin color ranges (except Martian or Avatar's Navis, perhaps). The sample application also provides Sliders to change these thresholds dynamically. Figure 3 illustrates the YCbCr color range that's used for thresholding. The Y is constant at 0.5; the Cb lower threshold is left and the upper threshold is right; the Cr lower threshold is at the top and the upper threshold is at the bottom. After the thresholding is performed and the pixel falls in the skin color range, a white pixel is written to the resulting WriteableBitmap. 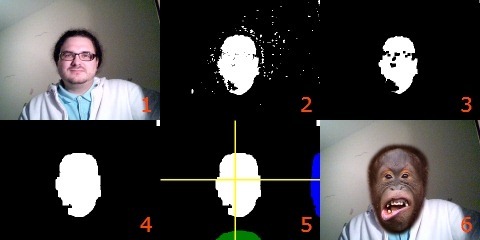 This results in a binary black & white image that masks skin color and is then used in the next step. The skin color-filtered image contains tiny pixel areas from the background that are mostly caused by image noise. Image noise can prevent a clear segmentation in later steps, so we have to remove it. 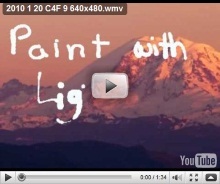 Erosion is a common image filter you can use for this task. The morphological Erosion operator reduces the boundaries of the colored regions so that very small regions are removed and only larger regions remain. It works by iterating over all pixels of the WriteableBitmap and testing to see if the neighboring pixels of the current pixel c are empty (zero) or not. If one of the neighboring pixels is empty, the current pixel c has to be a boundary pixel and thus must be removed (set to black). How many neighboring pixels are tested depends on the concrete implementation. This set of test coordinate points is usually called a kernel in image processing. Since the previous step produced a black & white image, we can use a simple binary Erosion operator here. It turns out that a 5 x 5 kernel is optimal for this use case. The for-loop that would usually be used to implement a generic Erosion operator is unrolled into 5 * 5 = 25 neighbor pixel tests for better performance. // it's clear that the current pixel is not a boundary pixel. 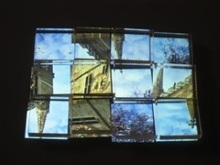 The Dilation enlarges the boundaries and expands an area by iterating over all pixels of the WriteableBitmap. This time, though, it's checked if one of the neighboring pixels of the current pixel c is not empty (white). If only one of the neighboring pixels is not empty, the current pixel c will be set to white. The best results are achieved when the Dilation with a 5 x 5 kernel is applied three times. // Is the pixel empty? // we set the result and continue with the next pixel. The skin color-filtered, eroded and dilated image is a good starting point for image segmentation, the process of portioning an image into multiple sets of pixels (segments). Image segmentation is typically used to find the location of certain objects. There are many different techniques available; a fast and simple method is histogram-based segmentation. An image histogram is a statistical representation of all the pixels present in the image. Most image editing tools have a color histogram functionality, which is commonly implemented as a graph that visualizes the amount of certain colors in an image. Figure 7 shows the color histogram of the sample image where the x-axis of the graph represents the brightness of each color component from 0 to 255, and the y-axis represents the number of pixels for each intensity. Since the skin color filtering produced a binary image, the histogram contains only two values for the number of black and white images and doesn‘t help us to find the skin segment. To fix this, we need the location of the white pixels maximum for the y-axis (rows) and x-axis (columns). Counting the white pixels separately for the rows and columns accomplishes this. 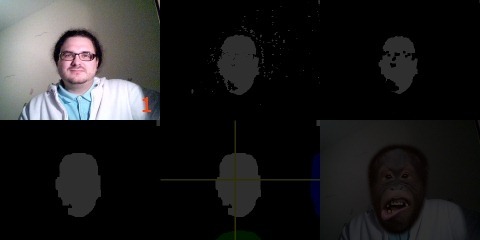 Figure 8 shows the row and column histogram for the webcam image where the blue color stands for row and the green for the column distribution of white pixels. The yellow lines highlight the maximum value for each. Now that we know the x- and y-coordinates of the white pixels' start / end and where the maximum peak is, we can use this information to perform the actual histogram-based segmentation. The simple approach we'll use here finds initial seeds where the histogram value is above half of the histogram's maximum. In the next sub step, the algorithm starts at the found seeds and tries to detect the segment's boundaries where the histogram value is below a certain threshold. Usually the face region will be the largest segment in the result list, which is why the segments are sorted by size. This approach is not perfect, but it's fast enough for real time and works for common webcam scenarios. After we get information about the position of the face, we can finally do something useful and fun with this data. The segment information calculated in the previous step contains the x- / y-coordinates of the segment's center and the width / height. 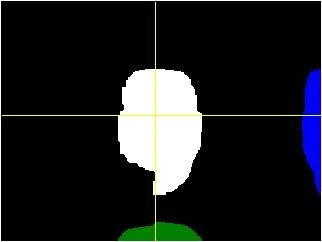 It's easy to highlight the facial region with this data (Figure 10): We use an empty image that's laid over the webcam output and draw a red ellipse into the image's bitmap using the WriteableBitmapEx library's DrawEllipse method. Highlighting the face is nice (although not much fun), but we can also use the segment information to put an image over the face and move / scale it to the appropriate position / size. In the first version of the application I've used a photo of Chuck Norris, but I changed it (due to legal issues). 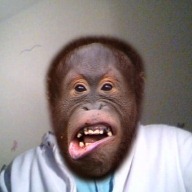 Fortunately I found a funny snapshot of an orangutan that Ethan Hein took and released under the Creative Commons license. The ape's head is the default overlay image (Figure 11), but you could apply a different picture by entering its URI in a TextBox. 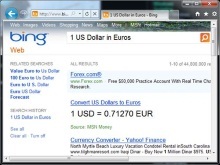 Beside the algorithms we discussed above, the application also has some extra functionality. You don't need these for detection itself, but they're worth explanation. You can take a snapshot of the final result (including the overlay) with the Button and send it to your friends, or use it as a profile picture or for your next passport. The code behind this functionality uses the WriteableBitmapEx library's WriteTga method to save the result into a TGA image file. // like an event handler, otherwise a SecurityException is thrown. If you don't have a webcam or just want to try a photo with the skin color face detection, you can use the Button to load an image from disk. The code behind the Button opens a file dialog and fills a WriteableBitmap with the image's data. If it's larger than the size of the element that will show it, the picture will be resized with WriteableBitmapEx library's Resize method. This article demonstrated how to implement a simple facial recognition system with Silverlight's new webcam feature and basic histogram-based skin color segmentation. This technique is not perfect, but it works in most webcam scenarios and in real time. There's definitely room for improvement in the segmentation method and in performance. If you like this article, I'll write a second part that covers a better segmentation approach, overall performance optimization and an extended demo. And if you want to try this out and learn more, the links to the live demo app and source code are at the top of the article! René Schulte is a .Net and Silverlight software developer from Dresden, Germany. He has a passion for computer graphics, physical simulations, AI and algorithms and loves C#, Shaders, Augmented Reality and the WriteableBitmap. He started the SLARToolkit, the WriteableBitmapEx and the Matrix3DEx Silverlight open source projects and has a Silverlight website powered by real time soft body physics. Contact information can be found on his Silverlight website or blog or via Twitter. 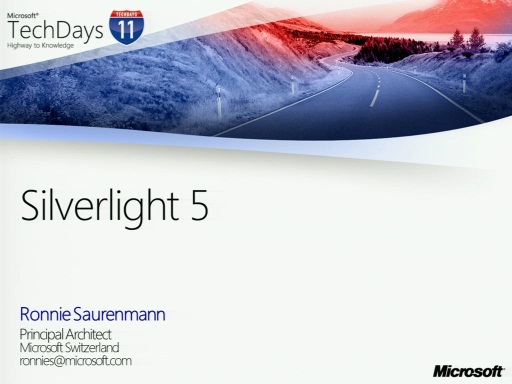 TechDays 11 Basel - What's new in Silverlight 5? Really awesome example René... interesting because it's Silverlight and also because it's something most developers haven't explore - facial recognition using color spaces - cool! Cool stuff Rene, Nice idea and well done. Keep hacking. Hi Rene good article. i like the custom approach you have used for basic computer vision task but I've been using an opencv c# wrapper called Emgu Cv and i think IMVHO it would fit perfectly in your articles and can help to achieve better result with minor effort. @Luca Del Tongo, the issue with Emgu Cv is the project is GPL. GPL is a nice license but Coding4Fun has a non-viral license policy. There is also AForge.net which does a pretty good job. 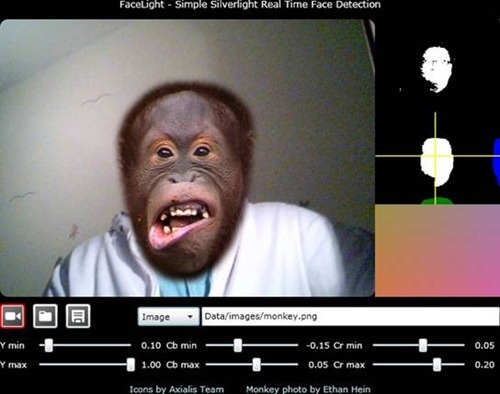 The title is "How To Look Like A Monkey - Simple Face Detection With Silverlight". After performing ColorRangeFilter, the image is shows only in black background. Could you please explain? I describe in the article that a certain color range is filtered and the result is a black / white image. White marks the filtered color. If your image doesn't contain any color in the range, you won't see white pixels. The app has some sliders to change the color range. It even shows a preview of the color range on the right side.